The book that kicked off a revolution in pain education and has become the 'go-to' pain bible for clinicians and sufferers now celebrates its 10th birthday with a second edition. Explain Pain looks similar to the first edition but includes many new references, language changes and a font change. Overall, the second edition of Explain Pain can be delivered with much more authority than the first. Explain Pain is a proven stayer among health texts. With great clarity and quirky images, it answers common questions asked by pain sufferers, such as "why am I in pain? ", "why has it spread?" and "what can I do to help?" Explain Pain gives new and immediate hope to pain sufferers and their family and friends. Explain Pain works! Written by Dr. David Butler and Dr. G. Lorimer Moseley. Illustrated. Spiral-bound softcover, 130 pages. Butler and Moseley present an evidence-based understanding of pain in a format that’s approachable and entertaining for therapists, patients or students. 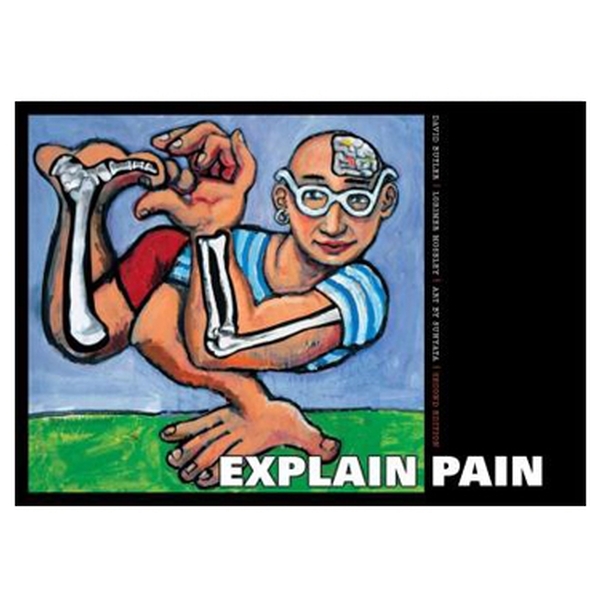 Explain Pain describes the complexities of the central nervous system for chronic pain patients in everyday language. Studies now show that understanding more about why things hurt can help patients go about their daily lives. This book aims to empower clinicians and pain sufferers to challenge pain, revise their view of pain and follow a scientific road to recovery. Recent scientific advances now offer a foundation to examine pain. Explain Pain covers how pain is a response produced by the brain, how responses from the autonomic motor and immune systems can contribute to pain, and why pain can remain long after tissues have healed. 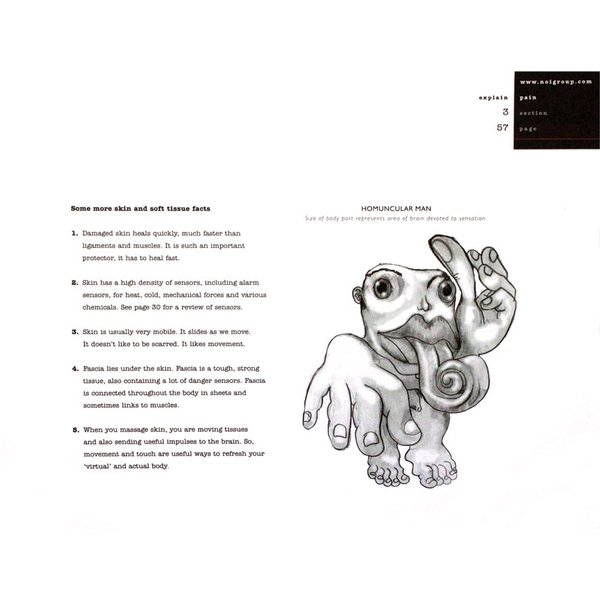 These and topics like inflammation, central sensitization, motor control and gene expression are simply presented and complemented by witty illustrations. 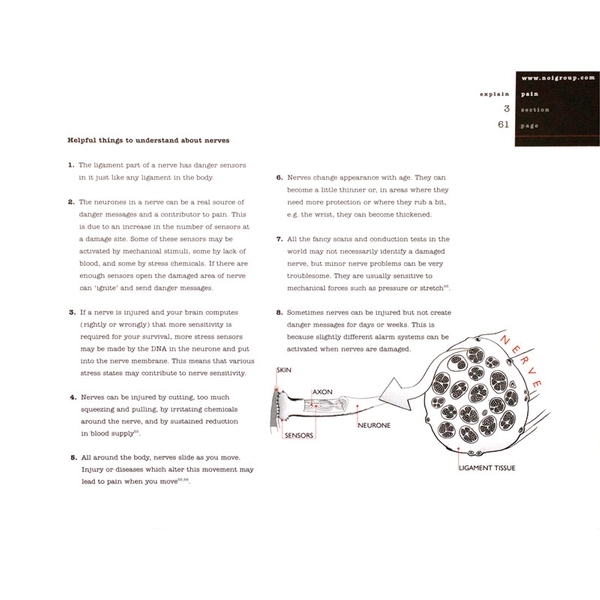 Second edition features new references, language changes and a font change. "...this is a great book! It is packed with the right messages for patients and healthcare providers and presented in a visually pleasing format. I highly recommend it for one's patient library and as an introductory summary for those who are entering the field of pain management." Dr. Loeser is professor of neurological surgery and anesthesiology at the University of Washington in Seattle.